Ministry of Economic Development (MED) has said that there was no special permission for any foreign photographer to operate in Maldives, warning that it will be put a stop to. Speaking to “Sun” on Wednesday, Registrar of Companies, Mariyam Wisam said that the photography industry was specialized only for locals, but that some foreign photographers were still working in the country. “Some big resorts are speaking in a way which is creating misunderstandings. They insist they have special permission. There is no special permission. We want to say clearly that no special permission has been given to any business or any party involved in tourism for any foreign photographer to make any agreement with a photography agency,” said Wisam. Wisam said that complaints regarding foreign photographers sent to Ministry of Economic Affairs were being looked into in association with Ministry of Tourism and Immigration. She noted that banning foreign photographers from working in Maldives was directly beneficial to the Maldivian youth. Foreign photographers have earned MVR 11 million within the first six months of this year alone, despite the ban. The government has on Monday shut the Maldivian market off to foreign photographers. Economic Minister Mohamed Saeed told Haveeru that foreign photographers had previously been given permits to work in the Maldives. Saeed, however, added that the Ministry has decided to stop issuing such permits. “What we want is to empower the Maldivian youth and to make establish photography as an industry in the country” the Minister said “Resorts operating in the Maldives will have to hire local photographers”. A local photographer’s association had recently voiced their concern over foreign photographers working for local businesses and effectively ‘monopolizing’ the industry. 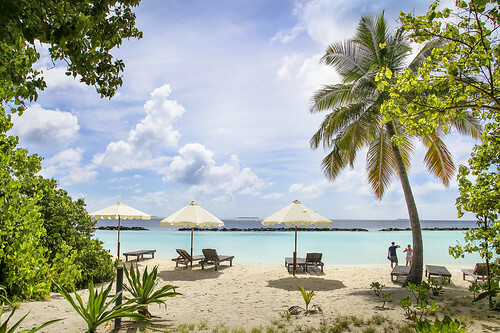 Royal Island Resort & Spa wins Best Luxury Romantic Hotel at World Luxury Hotel Awards, a photo by m o d e on Flickr. Royal Island Resort & Spa has been awarded as Best Luxury Romantic Hotel at the World Luxury Hotel and Spa Awards 2013. On the 1st of November the red-carpet was once again rolled out by the World Luxury Hotel Awards to welcome some of the world’s top hoteliers & leading decision-makers. The spotlight was turned on some of the world’s most sought after hotels, lodges and resorts as they arrived in great anticipation to pick-up their recognition as the winning results were revealed at the annual “glitzy affair”. Once again Maldives was triumphant by winning some of the top awards including overall winner of the night. Covered by France24 the World Luxury Hotel Award’s official media partner, the event included a 6 course gala dinner followed by top entertainment and presentation of coveted Awards. Our belief is that service excellence is the most critical factor in a hotel’s measure as a luxury hotel and winning a World Luxury Hotel Award would enhance performance levels if industry peers can be judged against other major players in the field. We can always be inspired to greater levels of excellence meaning exceeding customer’s expectations and paying attention to detail, said Marinique de Wet Director of the World Luxury Hotel Awards. World Luxury Hotel Awards events offer hoteliers with a unique opportunity to savour and celebrate their achievements of the past year with their industry peers. MV AEGEAN ODYSSEY is a premium class ship that was rebuilt to cater for cruising in the coastal waters of the central and eastern Mediterranean. The vessel provides the best features of a mid-size ship such as gracious public rooms, a choice of restaurants and stability in inclement weather. Originally a vessel carrying up to 570 passengers, Aegean Odyssey’s new configuration includes generously-sized suites, junior suites and staterooms with and without balconies. She now carries an average of 350 passengers. Ithaa Undersea Restaurant is Conrad Maldives Rangali Island’s unique undersea restaurant 16 feet below sea level. Marvel at 180° views of reef and marine life, sip champagne cocktails and savor Maldivian-Western fusion cuisine at this spectacular Maldives venue – the world’s first all-glass undersea restaurant. The government today lifted the nationwide ban on spas and massage parlors, revoking a circular sent by the Tourism Ministry last week which ordered spas to cease operations.